Prominent & Leading Wholesale Trader from Delhi, we offer flexbumin 20% albumin. 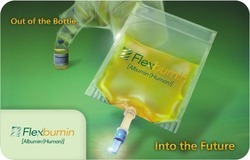 Flexbumin 20% infusion is a large molecular weight substance which remains restricted to the blood vessels and generates oncotic pressure (pressure produced by proteins in the blood). Looking for Alburel Injection for Madical Store ?